You recently published a video about “Spinning Soft Singles” for the Wool n’ Spinning community and I wanted to share with you how much your teaching content helped me to successfully do just that! I spun a beautiful soft single after I watched it! (Several times of course!) I tried several times before but just couldn’t get it right. Here is how it happened. The first thing I did was to study the photo of your single on the podcast feed. I even got out my angle tool to measure the twist angle so I would know what to shoot for. I decided to spin an art batt out of Shetland and various forms of silk so I separated it into smaller pieces and set up my wheel with a large whorl (~5:1) and low uptake to start as you so carefully instructed. Then I taped a length of yarn by the orifice just as you suggested and placed a knot at about 16” to standardize my distance of draft. I started treadling slowly about 5 times as I drafted back. Was it enough twist? Too much twist? How would I know? Oh, I could guess by comparing the angle of twist of my single against what I saw on your photo but the soft ply-back that you demonstrated was worth its weight in gold! I found that I could get a comfortable rhythm going with a 7.5:1 ratio and about 4 treadles to achieve this excellent result. Then I applied one more important skill that you so often exhibit without realizing it, I relaxed! What a fun spin it was! After I fulled it I had a nicely balanced soft single. I cannot thank you enough for your well-paced, specific instructions teaching how to spin soft singles. I am including a photo of my success story. I am already thinking about trying to use the yarn in a hap shawl that your “Year of the Hap” Ravelry group is working on this year. These types of notes are so incredible for me to receive and I wanted to say thank you for taking the time to message me. 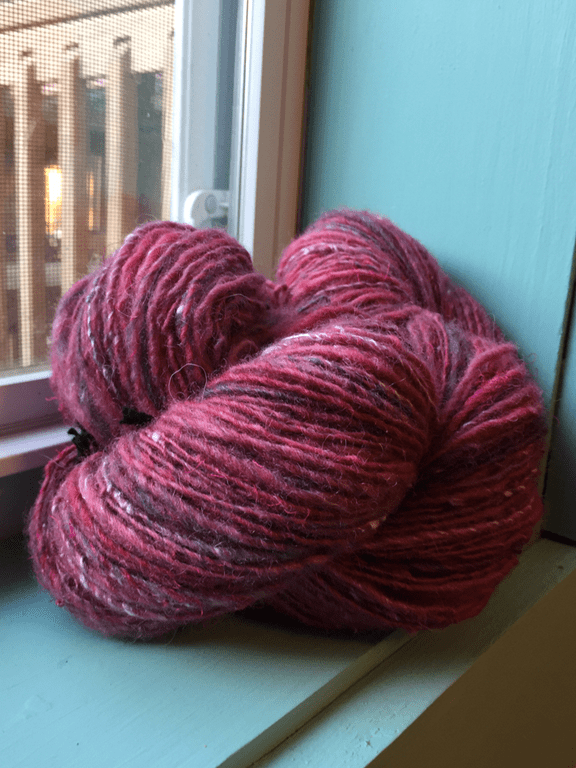 Mary’s yarn looks amazing – and it’s so important that we, as spinners, feel like we are continuously improving. Many of us like to try new things but sometimes it’s hard to push our comfort zones and that’s what the community it all about – we are here to support one another to grow and learn! Have you had something you really struggled with recently and relied on others to help you through? Please share below!